These were all warnings I heard before I visited. But this historic, sun-washed city held far more charms than I’d anticipated. Views of the Acropolis from the Plaka. 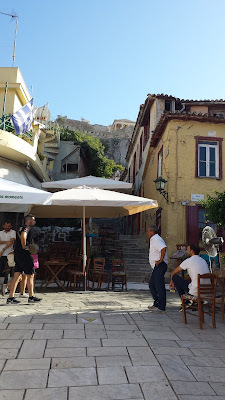 As with any city, ancient Athens has its less attractive neighborhoods, but there is plenty to like about it—and I’m not talking about just the Acropolis. No, there are plenty of reasons Athens is worth a stay much longer than a day. For starters, well, there is that Acropolis thing. And don’t shortchange it. To do it properly, you’ll need a full morning or afternoon (and a guide). And if it’s a warm day, water. Another tip: ancient marble that has seen the soles of millions of feet becomes slippery. So watch your step (most of which are uneven, incidentally), but be sure to relish the fact that you’re treading upon ancient stones that have witnessed the birth of democracy, Plato’s oratories, and visits by Alexander the Great. If visiting the Acropolis is the only thing you do in Athens, you’ll find that it was worth the trip. But there is plenty more to see and do. At the foot of the Acropolis is Dionysos, a restaurant with expansive terraces that just happen to have amazing views of, well, the Acropolis. If anything beats the experience of climbing around the ancient marbles of the ruins, it’s viewing it all from a short distance away. In the shadow of the Acropolis, the architecturally stunning New Acropolis Museum straddles excavated ancient ruins. All three levels stacked above the ancient foundation are loaded with statuary, busts, ceramics, mosaics and a rich assortment of artifacts from the Acropolis and nearby sites. After you’ve taken in the art and history, reward yourself with food and drink on the museum’s rooftop terrace which provides difficult-to-digest views of the Acropolis. View of the Acropolis from Dionysos. Maybe it’s just me, but after studying the Acropolis in college and pining to make a pilgrimage for dozens of years, I couldn’t get enough of the vistas of the ancient temple’s gleaming white marble columns rising high above the city. Interestingly, the more ouzo or wine you consume, the easier the jaw-dropping view is to digest. and Green Thumbs on Aiolou Street. While owls have ascended to hipster icon status during the past decade or so in the States, they’ve always been hip in Greece—well, for a mere few millennia, anyway. Symbol of Athena, Athen’s namesake, the owl is more common in this country than a Cubs hat in Chicago. If you’re into owls (or even if you’re not), you’ll find a rich assortment of the handcrafted variety in wood, ceramic, and stone at many shops. My favorites were at Dexipos Art Gallery—which I’ll get to next. Like any city that attracts crowds of tourists, Athens has a lot of shops stuffed with unremarkable souvenirs and crafts, some even sporting labels that read “Made in China”. 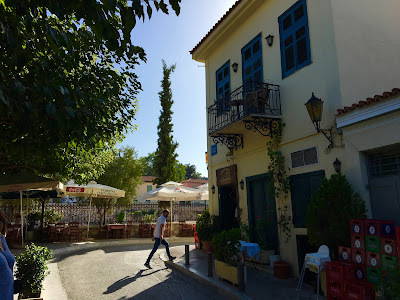 My favorite, Dexipos, is located deep in the Plaka, the oldest section of the city, and just above the ancient Roman Agora which lies in the shadows of the Acropolis. The gallery’s crowded rooms are crammed with a wide variety of ceramics, paintings and sculptures—from 15 euro owls to $6,000 ceramic versions of the Trojan horse that are the size of a small car. This is the perfect spot to find unique souvenirs and gifts that are hand-crafted and made in Greece. After you’ve finished shopping, visit one of the nearby sidewalk cafes that offer some shade, cold drinks, and views of the Acropolis above or the ruins of the Roman Agora below. If you’re in Athens for a quick trip and don’t have time to visit one of Greece’s famed islands, you can enjoy a bit of their atmosphere just half an hour’s drive from the city center. My favorite was Astir (25 euro entry), a private crescent beach set within an inlet guarded by rocky bluffs. It offers well-groomed sand, umbrellas, comfy lounges, crystalline water—and food and beverage service. And if you’re interested in sea views but not a beach, head to Ithaki, a fine aerie-like restaurant situated above the cove. Looking for the perfect spot for a final night’s dinner? Check out Première which sits atop the non-descript Hotel InterContinental. Michelin-starred and offering creative takes on traditional Greek foods and ingredients, Première boasts—what else?—views of the Acropolis. Particularly when the weather’s warm and the expansive terrace’s lounge areas and dining areas are open, this is the perfect spot for great food and drinks and a final view of the Acropolis. A street in the Plaka and the Roman Agora.